To this date liquid propellant rocket engines have propelled all the manned space flights, all the space vehicles flying to the planets or deep space, virtually all satellites, and the majority of medium range or intercontinental range ballistic missiles. Furthermore forces or turning moments provided by liquid propellant rocket engines have almost universally controlled the flight path direction and flight maneuvers of essentially all space vehicles. They have been an important essential enabling ingredient for space flight. 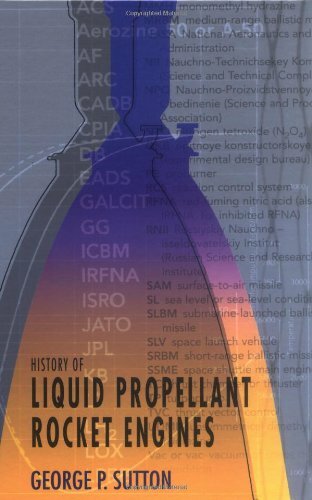 This new book, written by one of the foremost experts in rocket propulsion, gives an account of the liquid propellant rocket engine field over the last four-score and more years. It is the story about the technological advances that allowed progressive improvements in design, analysis, thrust magnitude, reliability, cost, and performance; where and when those advances were made, including unique engines from the countries most important to this technology; the groups, companies, or organizations of engineers, specialists, and dedicated people who made it happen; and the different kinds of flight vehicles that have been propelled by liquid propellant rocket engines. It describes the early pioneers, amateur rocket societies, evolution of key hardware components, past investigations of different liquid propellants, reorganizations and mergers of key companies, and the principal areas of current and former applications. Both large pump-fed rocket engine and low thrust gas-pressure-fed rocket engines with multiple thrusters are included. In addition to the United States, histories of rocket engines in Russia, Ukraine, Germany, France, Japan, the United Kingdom, the People's Republic of China, and India are discussed. this includes some unusual or novel engine features. "George Sutton couples his tremendous technical knowledge and experience with a unique historical perspective to provide a fascinating look at the development of the liquid rocket engine. This book locates and traces the threads of the liquid rocket engine technology development and weaves those threads together to provide a truly remarkable and insightful book.--Mark F. Fisher, Manager, MSFC Office of Exploration Systems"